Guest blogger Ben Sheehan is back with a retrospective on the interesting historical connections between Australia and Kenner prototypes. The vintage Star Wars grapevine rumbled last year with rumors that an Australian collector had purchased the only complete set of unreleased 2nd series Droids and Ewoks prototypes (currently) known to collecting. Just a decade ago, that idea would have seemed a notion less likely than the original wax sculpt for the Boba Fett action figure miraculously appearing at a museum exhibit in Paris (which it effectively did in 2012). Either way, Australia is a lot more famous for kangaroos than it is for vintage Star Wars prototypes. Yet, the country does have a longstanding link to them -- one established before even the first US based collectors began buying up pre-production pieces from Kenner employees around 1990 or so. Just like Paul Hogan, the Sydney Harbor bridge, and POTF Yak Face, pre-production material already existed Down Under before most collectors even became aware of it. 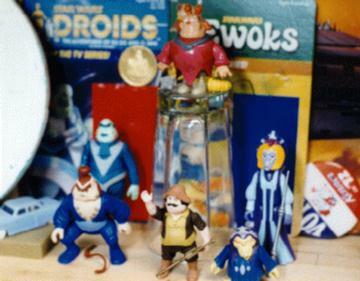 Australia is about as geographically dislocated from Kenner’s former Cincinnati headquarters as you can get, yet the very first prototypes sent to the antipodes came from the company directly – via Kenner’s sister business Toltoys (Kenner would acquire Toltoys completely by the mid 90s). Circa 1982, it wasn’t unusual to see the likes of Toltoys’ founding family water skiing with Kenner’s management on the Great Lakes in the USA, so this is not quite a surprise. In 1994 there were rumors of Toltoys employees having fired Rocket Fett missiles at each other across a table during a sales meeting in circa 1980 (though this has never been substantiated beyond that company anecdote, despite a good deal of research by US sleuth "Fluffy," myself and one toy dealer). What is startling perhaps, is how little remains of what Kenner sent over at this time. The tooling used to produce the locally made injection molded ESB era playset and single SW series vehicle were destroyed. Proof material for boxes, stickers and instructions have also been lost to the scrap heap. The only concrete evidence we really have of US made pre-production items in Australia is the existence of the Speeder Bike Concept Model that Kenner sent first to the UK, and then on to Australia for photography purposes. A Scout Walker used for the same images was tragically lost to a landfill after children and Aussie garbologists had their way with it. 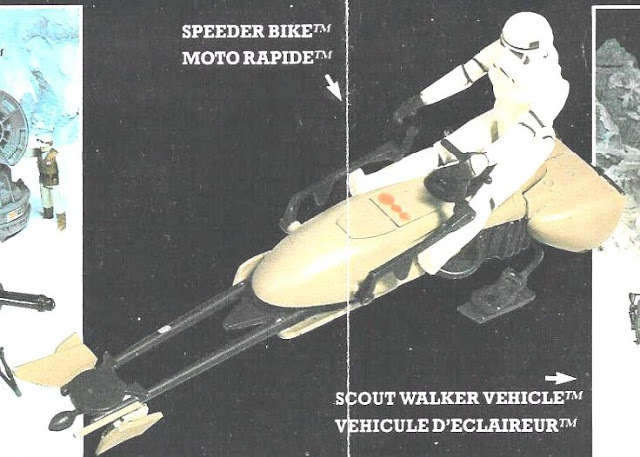 While the Speeder Bike itself is well known, the full story behind it is less familiar. 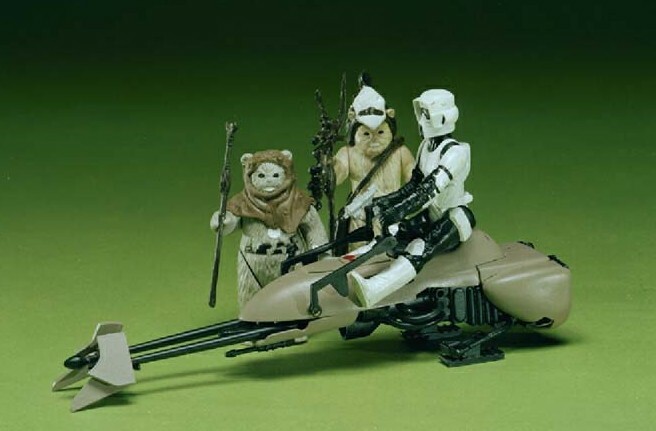 The painstakingly milled and molded prototype Speeder Bike arrived unceremoniously in Melbourne’s Comics R’ Us Prahran store, with a pile of loose figures circa 1998. It was purchased for a couple of dollars, and had seemed unremarkable enough that it was promptly gifted by the store owner to his one time employee, Troy Varker (now owner of World’s Best Comic Store Winner 2014, All Star Comics, Melbourne). A longtime collector (and former Tomart’s Custom Action Figure Design Contest Winner), Varker noted the prototype’s metal and resin construction, and intuitively sensed it was something significant -- despite being unaware that Kenner had even had a model shop. Without Varker’s intervention, it may never have survived at all. After carefully preserving the piece for some eight years, he allowed Toltoys.com Editor Will Sowth to post an image to the Rebelscum forums in 2006. 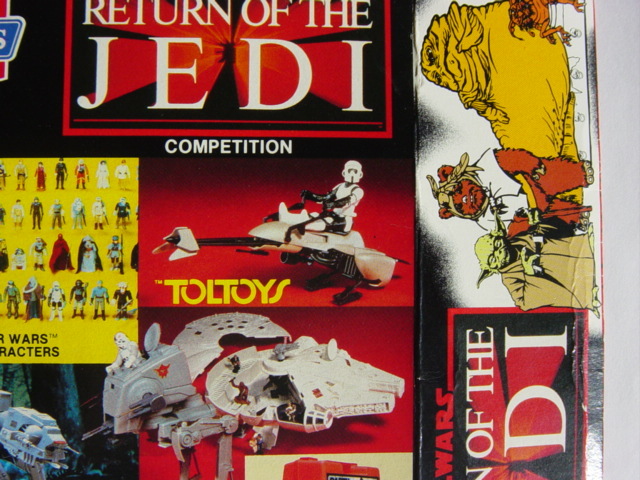 The piece was quickly identified by European forum members as belonging to a UK merchandising poster from Palitoy -- prior to Toltoys using it in multiple images for their own promotion. During a convoluted and at times confusing selling process, this author delicately maneuvered a deal to get the piece to SWCA Editor Chris Georgoulias (much to the chagrin of resident Archive poet John Alvarez). One year later, Will Sowth recognized the Speeder Bike again in an image from a Paul’s Ice Cream promotion, run in Australia around the time of ROTJ. That well-known image had been ignored by others Down Under, despite appearing on an expensive, highly sought after (by Australian collectors) box. 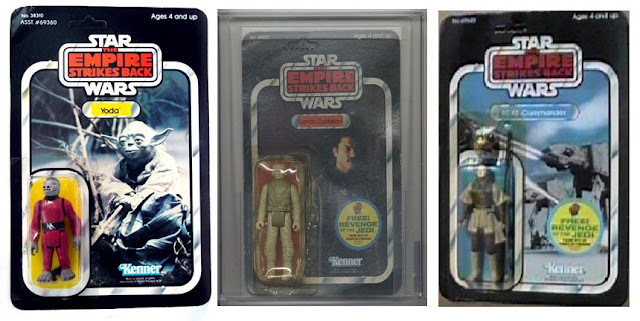 During a 2015 US trip, while trawling through Kenner photography from Kim Simmons in Atlanta, and I spotted it again -- this time on what looked like photo art from a box design identical to the one used for production. A message to Chris G. soon saw him find another image of it on a box mock-up (see the previous Archive Database link for more information). The chronicle of the piece now reads something like this: made in Cincinnati, sent to Australia via the UK. Found in a comic book store, identified online by Europeans; sold back to America, identified again by an Australian, then spotted in the Kenner photography archive by another prototype collecting Australian visiting the USA (who lived down the road from the store it originally turned up in) -- and finally recognized again by its new owner in another Kenner image. But it’s not just this prototype Speeder Bike that has turned up in Australia. Australia became home to 100s of carded samples and engineering pilots in the early 1990s. Many of these are around in number even today – hand-cut, ROTJ era bubble test pieces for Yoda on a ESB 41 Snaggletoothcard, multi-coloured Rebel Commando first shots, unpainted Bib Fortunas and other Jedi characters on late release ESB cards. In fairly recent times, a case of Nikto on ROTJ Hammerhead cards turned up. A few years back, Sydneysider Nick Johnston even purchased a Leia Boussh with a hand painted helmet that was stapled to an ESB Bossk card. The vast majority of these prototypes arrived via the Hong Kong warehouse cleanouts in the early 1990s, as stock was dumped by Kenner in one hell of a fire sale. As recently as 2004, a dealer invited me to look at one last warehouse full of that product (replete with Tri-Logo, Takara and other internationally licensed items), which was subsequently farmed out to other collectors and dealers around the world. Australia had long been a dumping ground for toy companies, and a mechanism already existed to place this stock on the collector market. Almost all of these prototype pieces were sold to dealers in the US during the mid to late 1990s and early 2000s (some would later come back to Australia). Yet the history of these carded prototypes goes even further back than the Hong Kong warehouse fire sale. Sometime in the mid 1980s, an Australian Venture store sold a Leia Poncho on a ROTJ 48 back Hoth Stormtrooper card to an unidentified collector. But it wasn’t just the odd cardback the figure came on that was notable. The figure’s cape was the pink fabric synonymous with ROTJ era soft goods test pieces. For a long time there had been no other recorded instance of a prototype not only making it out into the public realm during the vintage era, but actually being sold at retail (another one, believed to have been sold in the US has since been found). Nothing else has turned up since, but with the incredible rarity of so many Australian production items -- including ESB 12” dolls, the ESB vinyl cape Jawa, and more early release MOC figures than column space allows, it remains an outside chance that similar prototypes are still waiting to be discovered. While it’s recently become almost the de rigueur for collectors around the globe to put together incredible runs of vintage Kenner prototypes, Australia -- which was one of the smallest markets for Star Wars toys during the vintage retail era -- is the one country outside of the US to have actually contributed Kenner related items to the diminishing pool of supply. Yet it’s somehow taken a long time for Australians to develop a satellite culture of collecting vintage prototypes (such as the rumored unreleased Droids and Ewoks set) -- lagging a long way behind our Asian and European cousins (and ground zero in the USA). The last ten years have seen Down Under produce a genuine second and third wave of prototype collectors, after the mid to late 1990s saw the birth of the hobby locally. Almost perversely, this new era has roughly coincided with the export of the last locally sourced Kenner prototypes.